I often waffle between wanting to use my device naked (aka no case) and using a big, bulky case to protect my coveted smartphone. Typically what I do falls between the two extremes with some sort of slim case that provides a moderate degree of protection without giving up too much of the devices sleek form factor. The Toast real wood skin for the Nexus 6p is at the far end of the spectrum, providing a thin veneer between your device and the surrounding world. Note: Click images for larger size. Toast covers are very thin wood veneers, shaped and scored by computer-guided lasers. They are affixed to 3M adhesive that enables the many pieces of the skin to adhere to the curves, edges, and sides of your device. 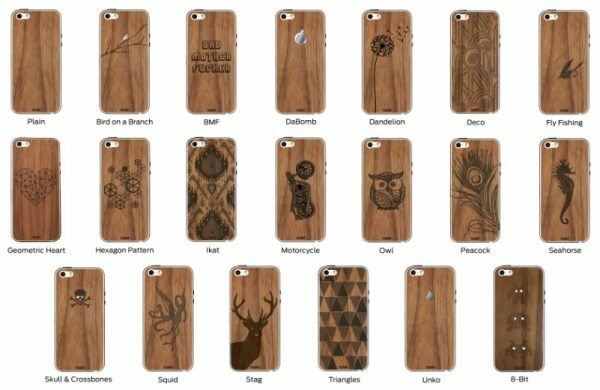 This wood skin attaches directly and securely to your smartphone protecting it from dust, dirt, and other particulates that can build up under common cases and ultimately scratch or damage the finish of your device. The wood skin is impressively thin. I would guesstimate that the wood’s thickness is between 1-2 millimeters or there a bout. It is not paper thin but pretty close to cardstock thin. The wood veneer skin is very fragile until it is installed on your device. Even removing the paper protecting the adhesive has to be done with a good deal of care. Above is an installation video from the Toast website showing the process of applying their wood skin onto a Nexus 6p. I followed their directions to the letter and had pretty good results. Though I do have to say…there is ZERO room for error when installing and absolutely no second chances. The 3M adhesive is very strong and once it touches the surface of the smartphone it is there to stay. 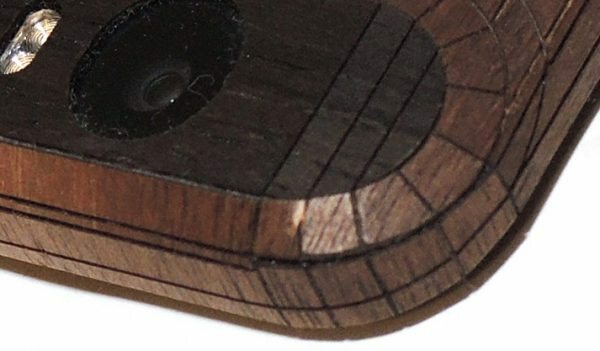 Aligning the top around the camera area and the back microphone hole is adjustable but once you lay-down the larger surface area onto the back of the N6p it is not coming off without damaging or destroying the fragile wood skin. Sadly, there is no doubt in my mind that if/when I remove the wood skin, it will be destroyed in the process. Here you can see the back is applied to my phone. I did not install the front skin to my Nexus due to my worry that when I removed it, the adhesive would pull my glass screen protector with it. I really like the look of the wood on the back and edges of my Nexus with the black front face providing a nice contrast. You can choose a matching or contrast wood type/color for the back glass inlay panel and the buttons. I choose walnut as the main color with the darker ebony for the camera and button inserts. 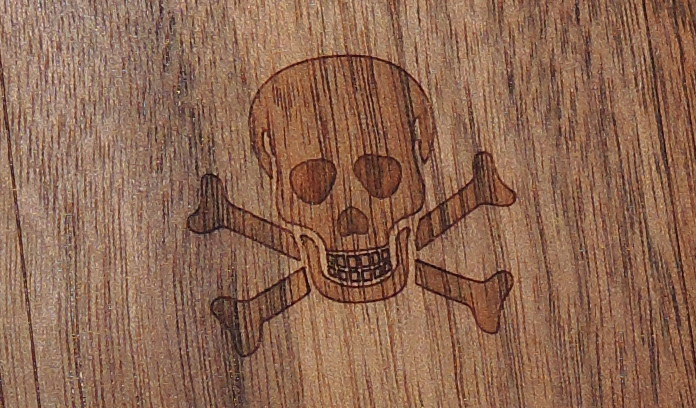 I also asked to have the Jolly Roger, skull and crossbones to be laser etched into the skin as well. The look and feel of the real wood is surprisingly nice, adding a bit of grip-ability to the slick and slim N6p without adding much if any bulk at all. Other than protecting the N6p from being scratched, the skin provides almost no protection from bumps or drops. The wood button covers are thicker than the rest of the veneer back/sides making them raised and easy to find. They do a great job pushing the buttons underneath. The SIM card slot cover is also made from the contrasting ebony and sits flush with the rest of the skin. It has a push thru hole to gain access to your SIM if needed. The top has a cutout for the headphone jack. Here you can see just how finely the laser cuts some of the pieces that wrap around the N6p’s curves. I was some fraction of a millimeter off to the right. One of the corners is not perfect but I am relatively pleased with the results nonetheless. Under super close examination, you can see a few spots where the pieces do not line up perfectly. In the picture above, I am attempting to capture the small knick in the wood. This happened in the first few days of using the skin. I believe the cause was the edge of the piece was not sitting perfectly and caught as I was either taking my phone in or out of a pocket. That said, I have been using the Toast skin on my N6p for two weeks and that is the only imperfection so far. Other than this initial knick, the skin is holding up very well. Toast has many standard designs you can have etched into the wood veneer or you can work with them to create a design of your own. Toast makes their unique skins for many of the most popular devices on the market. 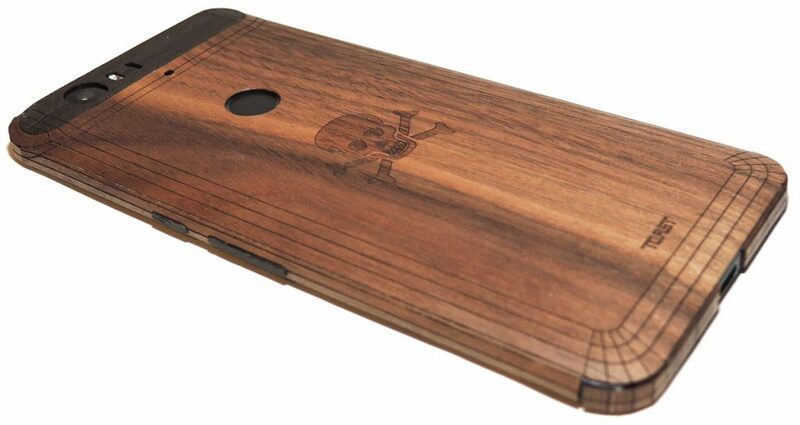 I really like the Toast real wood skin for the Nexus 6p and will keep it adhered to my smartphone as long as I can. It has a great look and feel that brings a unique old-world vibe to a modern device. Mine receives a surprising amount of compliments and the engineers in the group are impressed with how finely it is manufactured. In addition to bringing added character, the wood skin also adds grip-ability to a very slick piece of hardware. Though the thin veneer is about as minimalistic as it gets, providing little to no drop or impact protection. 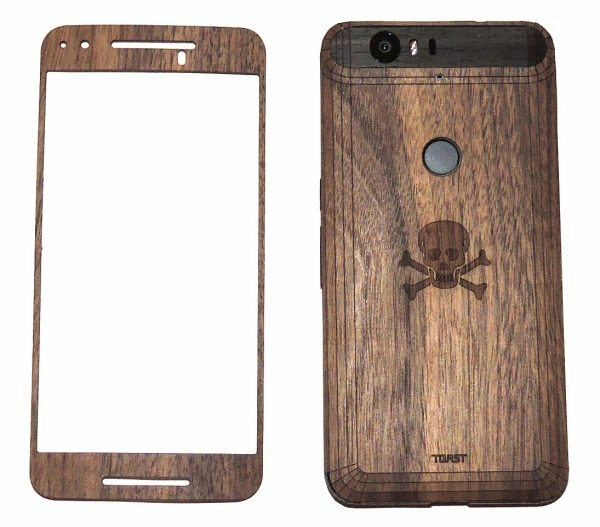 So, if you can live without a case and the constant threat of droppage, the Toast Made real wood skin for the Nexus 6p (or any device) is definitely worth considering. Just one afterthought: I removed the metal plate off the back of my N6p prior to applying the wood skin. This was due to the fact I did not want it to impact the installation or how the thin wood skin sat on/adhered to the back of my phone. I am glad I did but do regret not being able to use any of my magnetic car mounts. That said, I do have a suggestion for Toast: you should do the Jolly Roger (and other designs) as a cutout and inlay thin metal in its place…the contrasting stainless steel and wood would be very cool. Source: The sample for this review was provided by Toast. Please visit their site for more info and selection. 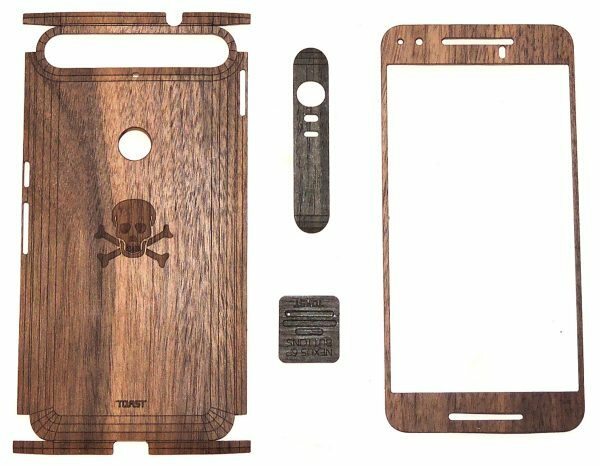 Toast Nexus 6p wood skin review originally appeared on The Gadgeteer on May 9, 2016 at 3:11 pm.